News of concern to US Patriots. Opinions and comments are my own! Rinku Devi, 28, with her one-week-old sons (yet to be named) at the Mati Sadan Parijat Nursing Home on August 5, 2011 in Muzaffarpur district of Bihar, India. 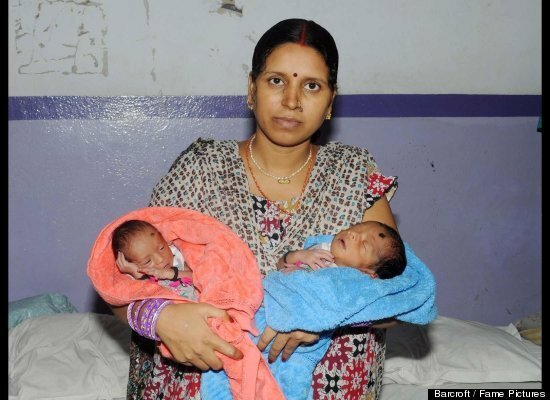 An Indian woman with two wombs has given birth to two boys ñ one from each uterus. Delighted mum Rinku Devi delivered her one-in-fifty-million babies last Friday (29 July) in the northern city of Patna. Stunned doctors said giving birth to healthy babies conceived in different ovaries is so rare an average of one case is reported each year anywhere in the world. The babies, however, are not twins as they were conceived at different times. According to gynaecologist Dr. Dipti Singh, “Rinku Devi suffers from a rare medical condition known as the uterus didelphys in which the womb develops in two parts, each with its own fallopian tube. It is quite a rare congenital condition and less than 100 women around the world are known to have it.” Rinku’s condition was not diagnosed until she went into labour pain, but after a one-hour long surgery she gave birth to two little boys weighing 2 kilograms and 1.5 kilograms respectively. In the age of fertility treatments, twins are more common than ever. But a pair of babies born to a woman in the village of Mathurapur Chakiya in West Champaran, India, on July 29, really beat the odds. That’s because their mother, Rinku Devi, 28, has two uteruses and conceived her kids, both boys, at different times, something that experts claim has a one-in-50-million chance of happening. The medical condition of having two uteruses in one body is known as uterus didelphys and reportedly affects less than 100 women around the world, according to India Today. Doctors say uterus didelphys represents a uterine malformation, where the uterus is present as a paired organ. In most cases, the women are not even aware of the condition. Chances of miscarriage, premature labor and underweight babies are high in such pregnancies. Dr. Singh, who delivered the babies by Caesarean section, said both Devi and the babies were doing fine, something that, again, isn’t that common. The surgery took about an hour and the boys, whose names have not been announced, weighed 3 pounds, 3 ounces and 4 pounds, 4 ounces, respectively, according to Barcroft Media. Although Devi will have twice as much work handling two babies, Dr. Singh says they can’t be officially called “twins” since one of the brothers was actually in utero three weeks longer. “It means Rinku conceived at different times,” she said, adding that unlike some other women born with a similar condition, she did not have two vaginas. In fact, Devi only found out about her unusual condition when she was in labor, even though she had delivered her first baby four years ago. “Since she carried only one child in one uterus at that time, it was not detected by doctors then,” Dipti said. Naturally, having this sprung on her while going through childbirth was intense to say the least. Neither had her family and they were understandably freaked out by the diagnosis. “They were initially worried when I told them about my condition but they heaved a sigh a relief after the delivery,” she said. However, Dr. Serena Chen, the director of the Reproductive Endocrine and Infertility department at St. Barnabas Medical Center in Livingston, New Jersey, is skeptical that the babies were conceived three weeks apart. Chen says in order to “truly know” the conception dates the doctors would have needed document that at the very early stages of pregnancy. The doctor says once ovulation occurs and pregnancy is established, the hormone progesterone suppresses ovulation such that releasing an egg one month later is extremely unlikely. She says the most likely scenario is still quite unusual. “It’s possible this woman released one egg from each ovary during the same month,” Chen said. “The twins may be different sizes because of individual factors. Still, double pregancies like Devi’s are exceptionally rare, but, even so, there have been very few cases of “double pregnancies” across the world in recent years. Last year, Angie Cromer, 3, a nurse from Murray, Utah, suffered from the same condition and delivered a boy and a girl. Like Devi’s sons, they were not twins because they were conceived at different times. In 2009, Sarah Reinfelder, 21, from Sault Ste. Marie, Michigan, gave birth to two premature babies through a similar condition and she says Devi has her work cut out for her. End the special ObamaCare exemptions for Congress! Stone Mountain’s Confederate flags will still fly!